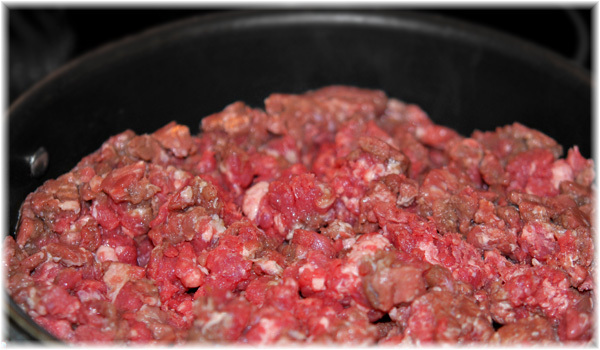 You can use any ground beef, or a mixture of ground beef and pork. 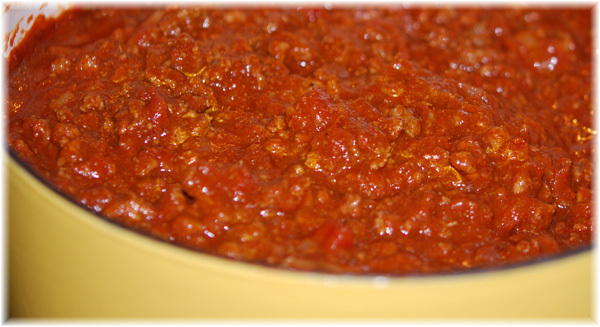 The best chili is made with coarse ground beef, or venison if you have a source for that. Your local grocery store butcher will probably grind it for you. I had mine grind a bottom round roast for me, and they were very happy to do it. But, even the prepackaged ground beef will work. I’m sure if you are a ground chicken or turkey person, you can use that. It’s just not my cup of tea. Brown the meat in a skillet until it is completely browned. 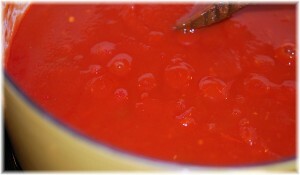 Remove it from the skillet and drain well in a large bowl lined with several thicknesses of paper towels. Let it set for a few minutes to drain. 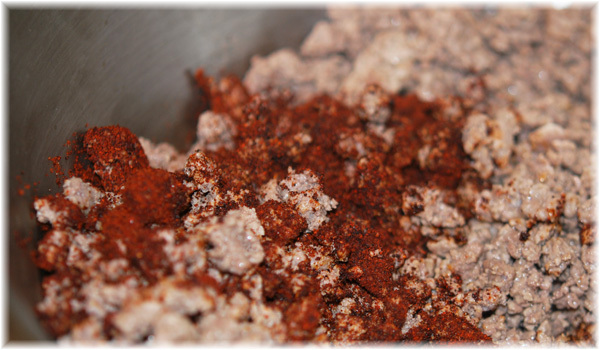 Remove paper towels from bowl and add chili powder and cumin to meat. Mix well. Sometimes, if I wanted to make things ahead of time, I stopped at this step, and let the meat cool in the fridge, packed it in ziplock bags and froze it to make chili later. I could package it in smaller portions for convenient smaller meals and other uses. It makes great tacos, for instance. By the way, remember that chili powder has salt in it. If you are restricting salt, there are salt free chili powders available, although I have not tried them. But don’t ADD salt to this recipe until you taste it. It is plenty salty! Put two large (29 oz) cans of tomato sauce, 1 6 oz can tomato paste and 1 10 oz can Rotel Diced Tomatoes & Green Chilies in at LEAST a 4 quart pot. Cook over low/medium heat until it starts to simmer, then turn it to low. While this is cooking, chop the onion. 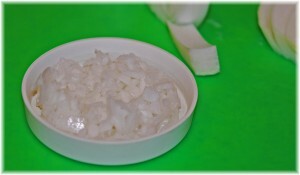 A big fresh white onion is best, but I used to always keep dried onions on hand just in case. About 1/3 cup of dried onion would substitute. 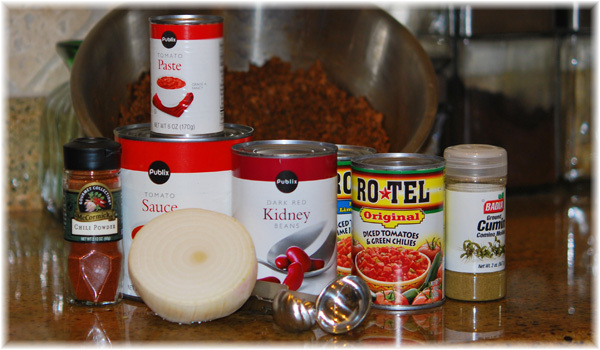 Hold out a scant handful of onion per bowl of chili and toss the rest of it into the simmering sauce. This is also the time to add a can of kidney beans beans if you are so inclined. At this point, the chili can simmer on very low heat for quite awhile. The flavor will mature. I think it needs to simmer at least 45 minutes, but you can serve it as soon as everything is heated all the way through if you have a hungry bunch of kids nipping at your heels. 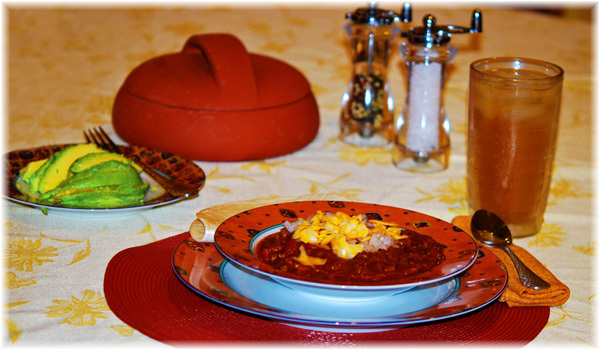 I think chili is sort of an all in one meal, especially if you serve it with a tortilla (or crackers) and some sliced avocado, which is green! 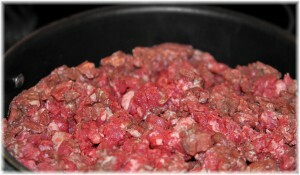 Throw the fresh diced onions on top (the ones you held out) and a little grated colby/jack cheese. Dinner or lunch. And this will serve a crowd. Or a couple or a single with leftovers. It freezes as well as anything I’ve ever tried. ummm! Perfect meal for today in Alaska. Donna, I made it once with Tofu. It was surprisingly good. While I know opinions are split, I never minded beans in your chili. And it might actually improve after being stored for a day or two. I agree, I like it with beans. If you notice it the picture, I snuck in a can. Sour cream? This is especially nice if your chili ends up hotter than expected. Great idea! I don’t know what isn’t good with sour cream. Poptarts are terrible with sour cream. You say this like a man who knows. Perhaps if you mixed a little powdered sugar in the sour cream, and then just a dollop? Now, now, am I gong to have to do a blog on making bibs? 😉 Robin, this would be great for you on those COLD winter days!